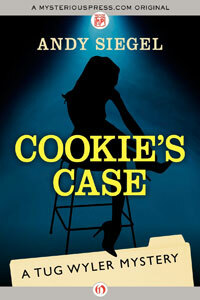 Cookie's Case by Andy Siegel: Synopsis and Online Purchase Options. Synopsis (from the publisher): Cookie, an angel in stiletto heels, is by far the most popular performer at Jingles Dance Bonanza. To her devoted audience, she's a friend, therapist, and shoulder to cry on, all rolled into one. While meeting an old pal at the club, Tug doesn't expect to pick up a new client but quickly realizes the gallant Cookie — dancing in a neck brace, each leg kick potentially her last — is in need of a committed champion. Righting wrongs is never a simple task for Tug, a sharp-witted and unorthodox trial lawyer who repeatedly finds himself in the middle of unusual cases and causes. But that doesn't stop him from trying. Believing that Cookie is the victim of a spine surgeon with a sloppy touch, Tug takes her case. But as he seeks both medical remedy and a fair shake for Cookie, he realizes — a tad too late — that sinister sights are now trained on him.